A GUI/CLI that monitors and controls the Tor connection. 2.designing around the concept that there is no communication between gw and ws. JasonJAyalaP added projects: Whonix, Apps, enhancement, usability. i am currently working on this ticket and got some questions. How much control do you want on those options ? do we want to aim this tool for advanced and novice users ? Patrick added subscribers: marmarek, mfc, bnvk and 2 others. Just signal newnym. No custom circuits. No extend circuits. Easy. Right. whonix-setup-wizard does this already. So we don't need this in Whonix Tor Controller. This ticket is already very old and has not been updated since. No. We get sdwdate-gui (tray icon). Good question. @bnvk is an UI designer. I don't know if he is ready yet to suggest what will be useful and how. I am also wondering now if it should become a "Whonix Tor Controller" or general "Tor Controller". A lot has changed since this ticket has been created. So I disagree with "not to implement the functions already being done by arm". Seems difficult. Maintenance intensive. Not sure if you would be up to maintain this? Differers per per supported platform. Doable. Perhaps useful alternative diagnosis tool as alternative to whonixcheck. Not really sure we need this since it's probably hard to provide better advice than whonixcheck. All in all, this ticket is a disaster. Not actionable. We need an updated proposal on what we're trying to accomplish without stretching it too much. For example if we want a Tor Controller, we should leave Whonix-Workstation out. I hope you're not deterred by that @goldstein. Whonix Tor Controller would be better i think. Just back from the Tor summer dev meeting. Idea T118 has been abandoned. (T118#6811) Pluggable transports will not change that often. Therefore, now there is some useful work to do. Implementing a Tor Bridge (circumvention) wizard. Do you know tor-launcher (screenshots)? Could you look at the latest version that comes with TBB please? And then copy/re-implement its GUI design? I.e. work on whonix-setup-wizard? Implementing a Tor Bridge (circumvention) wizard. to add Bridges to the torrc or to setup a bridge ? Do you know tor-launcher (screenshots)? Could you look at the latest version that comes with TBB please? And then copy/re-implement its GUI design? going to look at it , what do you mean by re-implement / copy its design ? A setup wizard (similar to tor-launcher) adding a bridge to torrc. what do you mean by re-implement / copy its design ? By design I meant here, how tor-launcher GUI is looking. How its windows are looking. The UX, user experience. Using the same or very similar textual strings. Using tor-launcher's style and then improving whonix-setup-wizard doing this. Should I create a new Issue for that ? It would be a matter of retesting first, then enabling the option "Tor is censored in my area" and add a page to the wizard that could look like the one in tor-launcher, including the custom brige option (if it's judged necessary). I think we should replace the current connection wizard page with the text by tor-launcher as much as possible. Because they did actual usability testing. Combine the option "Tor is censored or dangerous in my area" with option "I use a proxy or firewall settings to connect to the internet". Use the same text that tor-launcher uses. History: I guess it's only 4 options, because whonix-setup-wizard (graphical desktop gui) originally was a rewrite of whonixsetup (cli gui, not very appropriate for a graphical desktop). I didn't know better. Tools were limited. Not sure tor-launcher already existed [in Tor Browser stable]. I'm at the moment busy with another Project , I can maybe work on this at the Weekend . Its gonna take some time untill i can work on this. public Tor network to bridges. Or a different set of bridges. Or vice versa. makes it more difficult for most users. I'm not sure where the disclaimer pages fit in that scheme. They are not used in Qubes, do we want to keep them for VirtualBox / KVM? They are not used in Qubes, do we have to keep them for VirtualBox / KVM? long no one else builds and redistributes these images. Yes, but we still have the disclaimer pages and the repository wizard. I'll be able to create a new branch soon enough. Or perhaps a new package "Whonix Connection Wizard" and a separate "Whonix Repository Wizard" package? Please leave it in. Its useful to have and doesn't clutter up the wizard ui. I was only referring to the window title. We can have all these GUI in the same package. The default bridges are implemented. When the wizard restarts tor, it shows the bootstrap progress in a progress bar. The default bridges file is in /etc/bridges for not finding a better place. It's in json format, so it could be difficult to have a proper .d configuration mechanism. That should not be a big issue since the choice for custom bridges will be given. The AppArmor denied message popping when using scramblesuit has gone after disabling and re-enabling the obfsproxy profile. Will look into that. I guess introducing /etc/bridges would lead to confusion. have a .d mechanism to extend the default ones. Can https://github.com/troubadoour/whonix-setup-wizard/blob/tor-launcher-clone/etc/apparmor.d/local/usr.bin.obfsproxy be moved to https://github.com/Whonix/anon-gw-anonymizer-config/tree/master/etc/apparmor.d/local please? For? I don't understand why we should use the anondist file for anything. It should just be a symlink. When rerenning kdesudo whonix-setup-wizard setup (or quick) I just keep getting the finish screen. Not the connection setup again. In tor 0.2.7.5, tor.service is a one shot service. When restarted, it returns immediately status 0, regardless of tor status. If used directly, we have to add a time.sleep in order to get the control port ready. kdesudo whonix-setup-wizard quick works great. A totally missing DisableNetwork 0 in /etc/tor/torrc doesn't break it. obfs3, obfs4, scramblesuit all working. kdesudo whonix-setup-wizard quick -> Disable is broken. It's great for debugging that we see the output of Tor service restarts when start from command line. Please remove the grayed out transports. I guess the grayed out ones would generate more support requests than not showing them at all. This is the ClientTransportPlugin that TBB adds when choosing obfs4. To simplify the code a bit, I am wondering if when using bridges, if we should always add all ClientTransportPlugin lines that Whonix supports. I.e. man obfs4proxy indicates this should work. However, it does not work for me, unless I remove ,scramblesuit. Perhaps that would make later user manual configurations easier? And always adding all ClientTransportPlugin in bridge mode would perhaps also simplify the code a bit? Explanation [attempt, it's a nasty one]. The AppArmor denied messages generated by scramblesuit or obfs3 are one shot errors. For example, after /var/lib/tor/pt_state/scramblesuit has been read once , it seems that subsequent uses of scramblesuit don't check for it any longer. The extra lines can then be commented or removed without any effect. It was working on your system (like mine) most likely because you tested earlier with the local/usr.bin.obfsproxy profile. The messages did show up after a fresh whonix-gw / sys-whonix installation (wanted to remove obfsproxy package, but it would remove whonix-gateway too). Alternatively you could modify the anon-gateway-packages-recommended package. Remove obfsproxy from its dependencies. Then rebuild anon-meta-packages usual the usual make deb-pkg. Use dpkg -i to install the newly build anon-gateway-packages-recommended deb. Then the dependency would be gone and you could uninstall the obfsproxy package. Made the back button as well as a cancel button available even during the bootstrap phase. For this, a bootstrapping thread is running beside the qt loop. And that brings me to a point I wanted to raise for some time. We cannot afford a sys.exit(0) in the middle of a secondary thread. Which means that the wizard would be the same for VirtuaBox/KVM and Qubes (an improvement maintenance-wise) starting with a Next button, ending with a Finish button. At this stage, adding the proposed code to the existing whonix-setup-wizard is getting difficult. This piece of software is already overly complicated in my opinion (not mentioning someone else, I can project myself a few years forward, if for any reason I have to find my way in that maze). That's why I suggest to split the wizard in two pieces [packages] at least. whonix-connection-wizard: a clone of Tor Launcher, in Whonix Gateway/whonix-gw. whonix-setup-wizard: locale settings, disclaimer, whonix-repository, first use notice, in both gateway and workstation. It would imply a re-work of the initializer, autostart, status files... Doable. Instead of whonix-connection-wizard, we can even make this even a generic package, anon-connection-wizard? Don't take it as face value. And it may look more difficult than it is. A lot has already been sorted out. 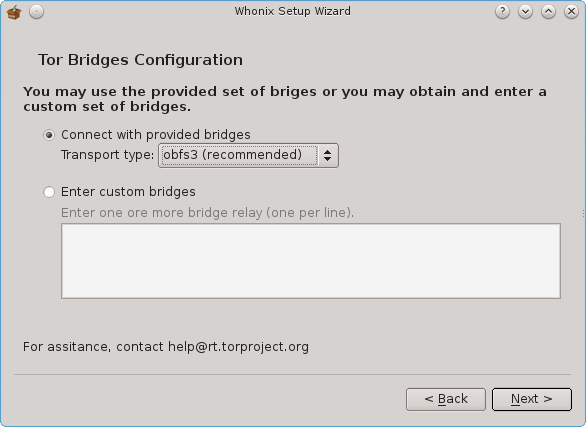 anon-connection-wizard is functional with the bridges, and the Disable Tor option is implemented. Now, I'll have to digest https://www.whonix.org/pipermail/whonix-devel/2015-December/000467.html before I can reply. That may influence the development. There is a new warning page when trying to connect directly and a bridge/proxy configuration exists. Will implement that, as well the new text.